HISTORY OF EOTECHIn the 1950s ERIM researchers developed several technologies which lead to the invention of the HUD (heads up display) nearly 30 years later in the 1980s. Now thirty years later in 2011 HUD systems are not in every home, however they are features on luxury cars, prolific in the military, and of course represent over 50% of yearly total optics sales on firearms. The technology for HUD or reflex sights is not especially complex, what is tough is making that image hold a point over time (i.e. hold zero), be durable, and most importantly not be $1 Million per unit. ERIM later formed a company call EOTECH and in 2000 launched the commercial line of HUD EOTECH sights we now enjoy and the military depends on each and every shot. 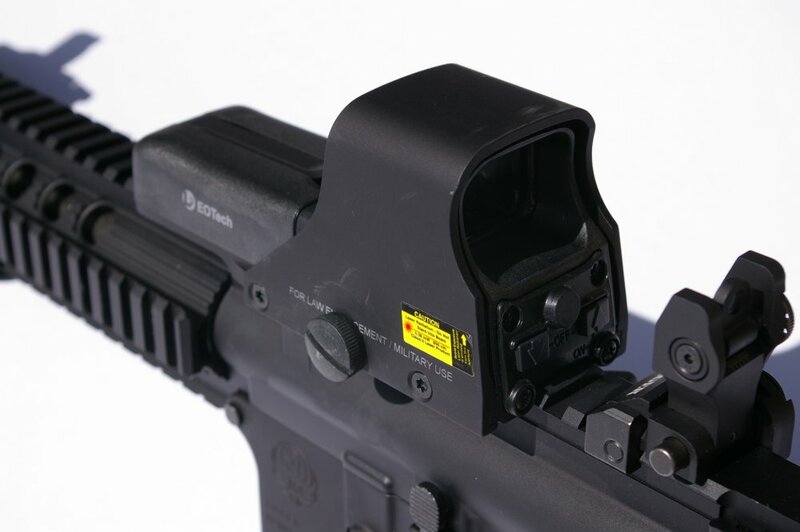 The EOTech HWS (Holographic Weapon Sight) is now renowned for its speed and represents the fastest reticle to target acquisition sighting system in the world. The 512’s 65 MOA ring was scientifically tested to allow the eye to acquire the image faster than any single dot or solid image. This allows users to move the sighting image (reticle) onto the target faster, with less time spent searching for the sighting image. At the same time, the 1 MOA dot in the center of the reticle is a very small image which allows for precise shot placement. Now equipped with electronic weapon sights, our troops have the highest hit ration in US military history. May people believe holographic sights are fragile however that stigma has changed significantly in just a couple years through our significant combat engagements overseas. 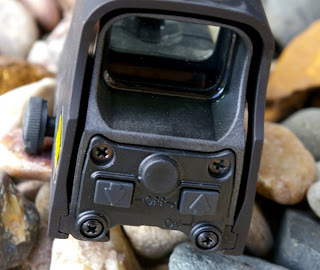 With EOTECH’s sights, the holographic reticle image is recorded in every particle of the glass. If the glass is shattered or covered with debris the sight is still fully functional. Zero, point of aim & point of impact are maintained. Another big advantage is the shooter/operator can engage targets while keeping both eyes open because of the distortion free 0X magnification. The other advantage is field of view. Looking through the large rectangular window with both eyes open allows the shooter to maintain peripheral field of view. This is essential in military and law enforcement where knowing what’s going on around you can mean the difference between life or death. FIT & FINISH - Like you would expect with any other Mil-Spec product, the fit is perfect between each and every part on an EOTECH sight is first rate.. When mounting up to a standard 1913 picatinny railed AR15 upper, it locked down tightly and didn’t budge a bit regardless of how hard I pushed the sight and most importantly returned to zero after removal and re-mounting. 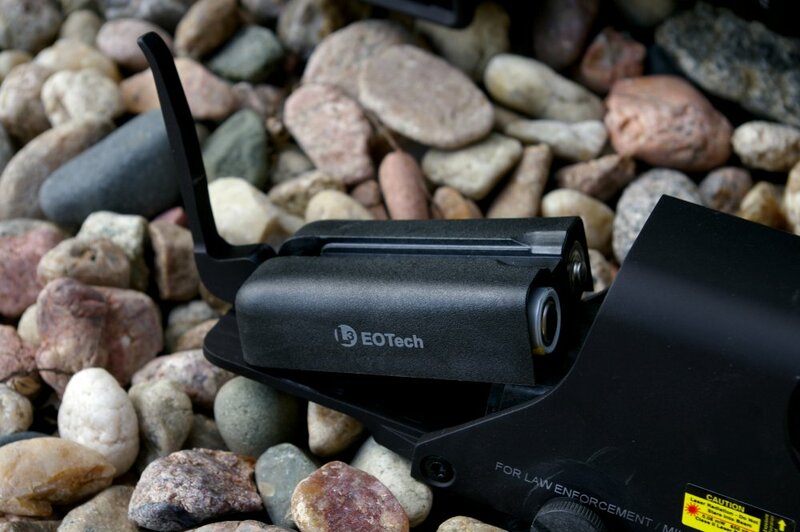 The Eotech’s have been famous for their rugged feel and durability. Suffice to say the Eo-tech is a solid piece of equipment that even the military has failed to destroy. FUNCTION - The Model 512 is the most popular model HWS. This tactical optic is perfect for agencies that want the best in CQB speed and versatility, without the need for night vision compatibility and simple AA battery power. The 512 is the longest of the EOTech sights due to the AA battery power and depending on the firearm can prevent unencumbered access to the rear two operation buttons if you are running rear BUS (back up sights). I found that on several of the standard AR15’s in my inventory with BUS and standard plastic forends, the 512 could not be comfortably mounted forward enough to comfortable work the buttons with tactical gloves due to interference with the front forend. 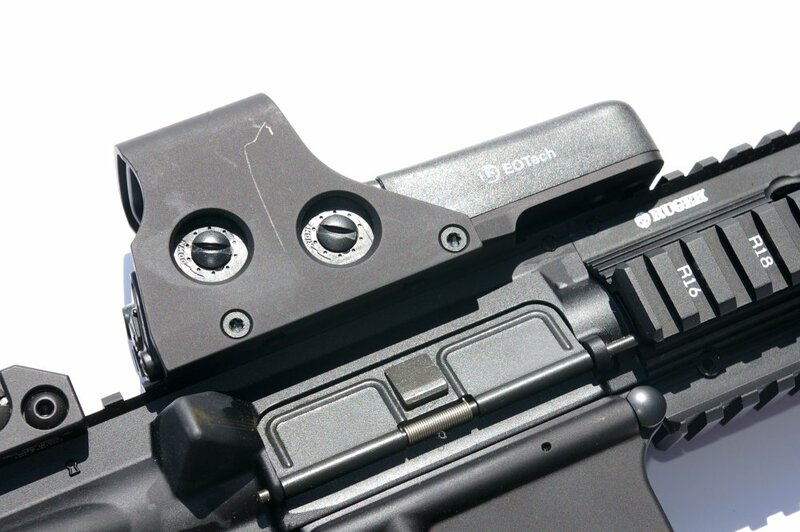 I did not have any issues with any AR15’s with Magpul forends or aluminum/billet forends and the EOTech 512 could be easily mounted forward enough that one extra rail number to allow for easy access to the controls even if the rear sight was up. 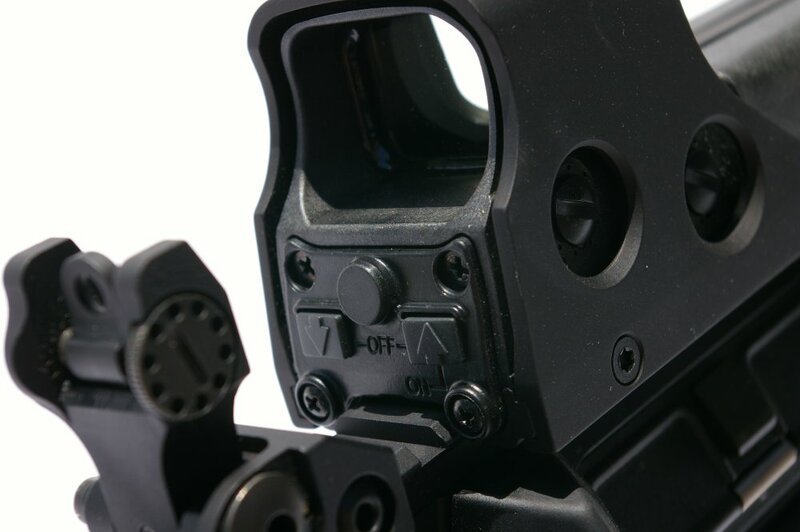 EOTech’s sights feature auto shut offs after 4 or 8 hours of operation from the time the last adjustment is made. This conserves power and assures the sight is not setting idle. Other features are a low battery indicator, an auto power-up to a normal setting, and instant on. Operation is simple. Hit the right up button and the unit powers on instantly to “standard brightness”. The brightness of the reticle can then be adjusted up or down using the up/down buttons. Once you want to turn the unit off, simply press and hold the up and down buttons simultaneously and the unit shuts down. 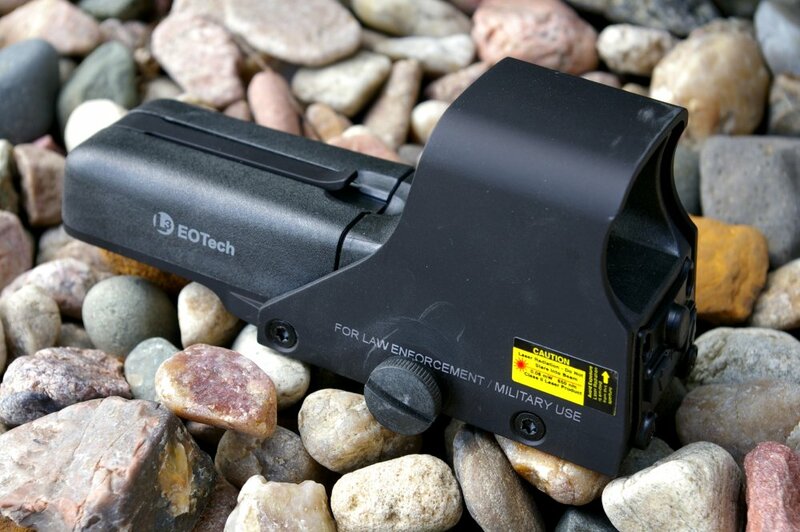 FEATURES - EOTech taughts their Field-of-View is more than twice as wide as “red dot” competitor and is completely passive which means that no light will be omitted to give away your position to the “other guy” or scare game. I should note not all red-dot sights do this and most can be seen from the opposing direction. In the case of the EOTech’s, the Operator and hunter will remain undetectable. 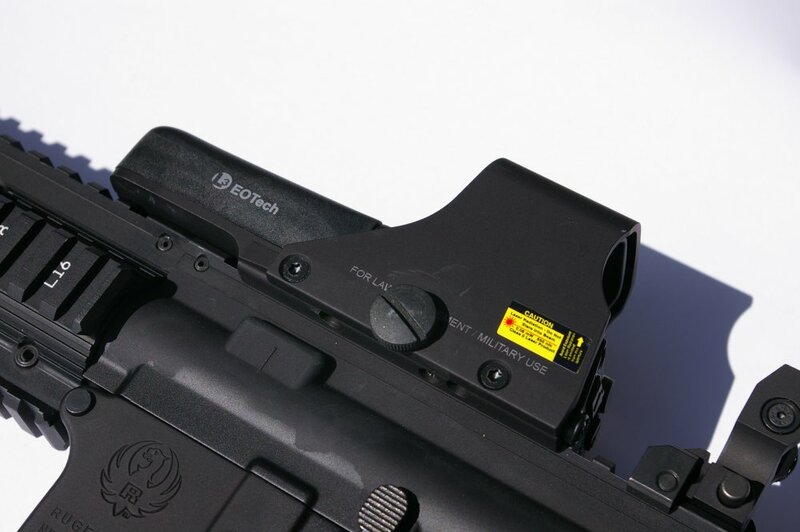 Eotech sights are now not just for the Military. Hunters and outdoorsman are discovering that quick target aquiring 1X red dot sights are just as handy the middle of Iowa hunting deer as in Afghanistan hunting Taliban. The Model 512 is the most popular model HWS. This tactical optic is perfect for agencies that want the best in CQB speed and versatility, without the need for night vision compatibility. ACCURACY - The EOTECH sights help you shoot and acquire target more accurately. It you don’t believe this then you simple have not shot enough with a Holographic Weapon or Red Dot sight. 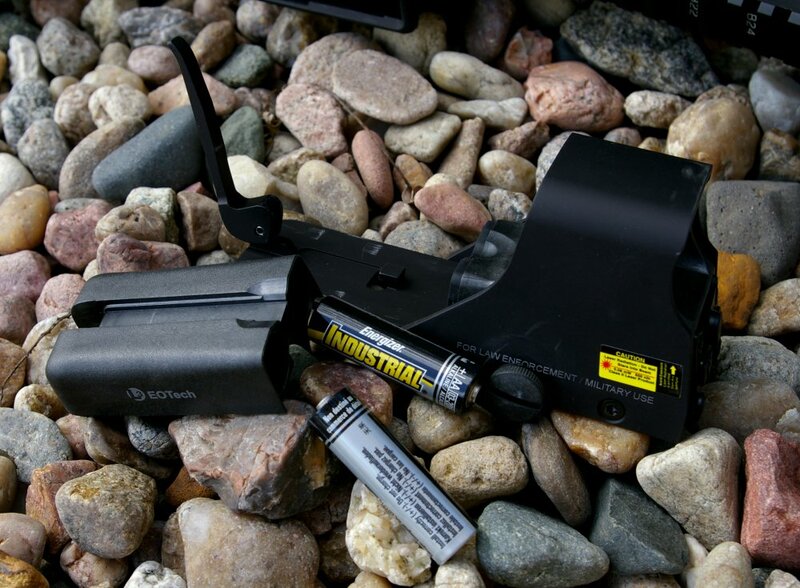 There is a reason the majority of the military and nearly all major competitive shooters use electronic sights... they get you on target faster than any other sighting system. One thing EOTech forgot to mention in their marketing info was the brightness advantage of the EOTech sights over other Red Dot designs. Turn off the lights and look through a typical Red Dot and you instantly notice significantly darker sight picture than through the EOTech models. 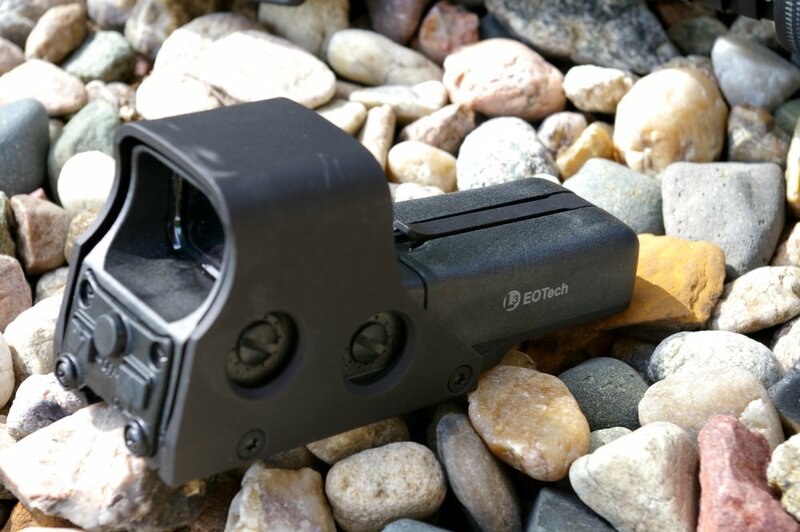 As most bad stuff happens at night or the best hunts happen at dusk/dawn, the EOTech would seem to have a distinct advantage over other sights on the market. The other complaint I hear is “those high end weapons sights are so expensive”, which is a falicy. How much do you spend on a good set of steel AR sights? About $300 which still will not get you the advantages of the EOTech sight. Personally I would rather spurge on a military proven optic and save a few bucks using some less expensive back up sight options. Once other potin is that the 512 makes a lot of sense from a long-term survival situation or even out back hunting situation. How many convenience shops in the middle of nowhere have CR123 batteries, but all have AA. Excellent product. You might want to spell check the article. Sorry, I am a raw writer and it is known I have some gramatical errors. I had an editor, however she did not enjoy working for free.